Give outstanding riding lessons and prepare your horses and students perfectly, so that they will be the riding stars of the future. You prefer taking part in competitions yourself? Go for it and show your amazing talent! Relax while riding through the wonderful country side or while shopping downtown. And when you see your horses frolic out at feed, you can call them with a simple whistle. What are you waiting for? Your first guests are already expecting you! Does anyone have any to sell? This game sound very interesting! I was wondering if anyone has one to sell. That way I can consider the game in my list to get next. i have this game too but i'm stuck on building a guest house. It's ok but it doesn't tell you how to do anything. I have had it for quite a bit of time and I have new games so I rarely play this game now. It's in really good nick and I have the case for it and everything! I don't recommend buying this. It really isn't worth the price. You can get stuck easily along the way. The hardest one I had was breeding. It may sound fun training your students, but I got real stuck up and rude ones. It took me about a month just to get them to be nice towards me and the horses. It looks a lot like Pet Vet. The graphics on Pet Vet are the same as this: Crummy. i am looking for this game because it sounds like my thing, so if any one has one that they are selling please let me know thanks! omg! the setting looks sooo much like the pet vet game! I like this game but it is quite boring. I completed it in a couple of hours. I got it for my birthday. I honestly think Riding Stables 2 is better. I do not have this game and it sounds O.K. I might like to try it. Does anyone know how much it is? this game is amazing! i don't now what your talking about!!!!! i have been riding and looking after horses for about 6 years and this is a bit like it. 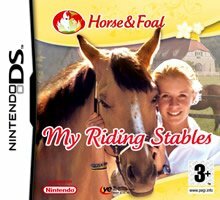 sure the graphics could change a bit but it isn't the newest game in the world so don't ever judge a ds game by its cover (to the one who said "i have never played it but it sounds boring"). THANK YOU I HOPE THAT YYYOOOOOUUUUU MIGHT PLAY THIS GAME! this is pretty good, i have it, but it's boring, the graphics are bad, and i completed in 2 days! it's sort of cartoonish. Well I have this game and It's quite alright and it has all the basics down, for example, Breeding, riding, vacating for people and students, medical care and horse dealing. It's okay I guess but it could be better.